When I was tagged by Kory to offer up a "Now + Then" post, I took some time to read through the posts from those who have participated in the past. I must admit, I'm a few years older than you all! Because it's been nearly 10 years since I graduated from college (gulp), I thought I'd reminisce about the early college years. Thank goodness for professional photographers. My husband (cheesy, I know… but I can’t help myself!). I read for fun now that the pile of assigned reading is gone. I read magazines regularly to see which publications might take submissions and I try to keep up with my favorite blogs as much as possible. I try to keep it simple. Lots of denim, flats, blazers, flowy tops and sweaters. I no longer frequent the tanning salon. My skin thanks me, daily. I recently cut my hair to my jaw line, but I tend to like it long with layers. I also quit dying my hair about four years ago and haven’t looked back. Travel, outdoor adventure, cooking, home improvement and reading. Work hard at things that inspire me and know that my path doesn’t need to look like the paths of others. What am I not dreaming about? My life list sums it up quite nicely. Travel, work, explore, create, travel. Repeat. So grateful that social media had yet to catch on. I honestly can’t remember, but I know I was awfully fond of Tim McGraw. Think: books upon books and not much time for anything else. I was big on linen pants and peasant tops for some reason (I blame Rachel from Friends). I also thought of my tan as an accessory. Yuck. High maintenance! Long layers, flat ironed every day. Lots of highlights and low lights (again, think Rachel in the later years). School and work kept me pretty busy, but I definitely enjoyed a good house party or day at the river. Study hard, prove yourself and please other people. So, there you have it. Thankfully, I've grown up a bit over the last decade or so. Anyone else glad to have grown out of certain habits and pastimes? 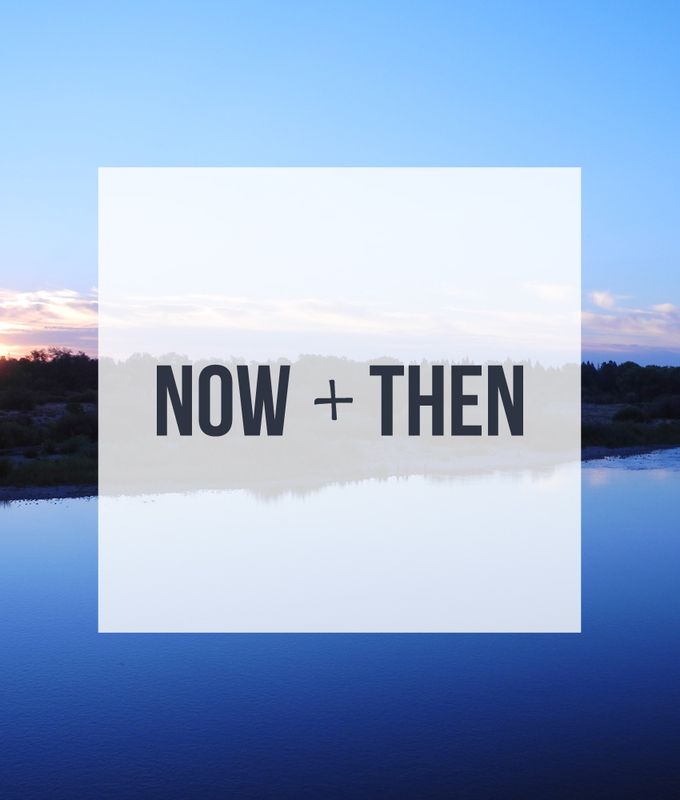 I'm going to follow Liz's lead and tag anyone who's interested in sharing their own "Now + Then" post. Just be sure to stop by and link up in the comment section if you play along!